The Coaster Brook Trout Research Unit is an advocacy initiative intended to raise awarenes of this significant segment of the eastern brook trout species salvelinus fontinalis, once common in Lake Superior, but now rare. Along with lake trout salvelinus namaycush, they comprise the two char species native to Lake Superior. Not a separate species or even subspecies, coasters occur when environmental and habitat conditions are ideal and enable this species to fully exploit their evolutionary niche. These conditions once occured around most of Lake Superior. Today, only remnant populations exist, primarily in the Nipigon Bay region of Ontario. Three small distinct populations also exist near Isle Royale and one in the Salmon-Trout River on Michigan’s Upper Peninsula. A petition in Michigan to have this strain of brook trout listed as endangered and thus protected under the Endangered Species Act was unsuccessful. Because of the limited sport fishing opportunities for coaster brook trout, many anglers are unaware of their existence, and the coaster does not have a large constituent group as its advocate. 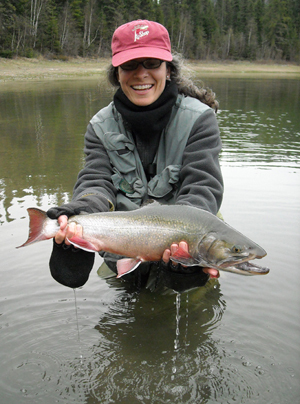 The Coaster Brook Trout Research Unit is intended to boost this advocacy. We encourage anglers to pursue coaster brook trout and share their appreciation of this unique and beautiful fish.